Hart Hill Winding Hole is a minor waterways place minor waterways place place on the waterways major waterways place village town city on the Birmingham Canal Navigations (Dudley Canal No 1 - Through Route) between Black Delph (Junction of Dudley and Stourbridge Canals) (1 mile and 3 furlongs and 8 locks to the southwest) and Parkhead Junction (Junction of Dudley Canals Nos 1 and 2) (5¾ furlongs and 1 lock to the northeast). The nearest place in the direction of Black Delph is Norish British Steel Bridge; 2 furlongs away. The nearest place in the direction of Parkhead Junction is Woodside Bridge (Also known as Limekilns Bridge. Low bridge, take care); ¾ furlongs away. Lower Mall, Brierley Hill, DY5 1QX — 1385 yards to the south. 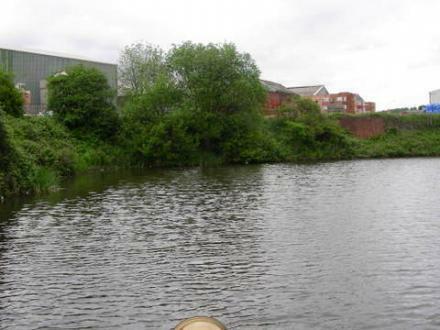 The Waterfront, Brierley Hill, DY51XJ — 743 yards to the southwest. Intu merryhill centre pedmore road, Brierley Hill, DY5 1QX — 1398 yards to the south. 33 High Street, Brierley Hill, DY5 3HX — 1549 yards to the west. 161 Bank st, Brierley Hill, DY5 3DD — 1331 yards to the southwest. 1 Hagley Court South, Waterfront East,, Brierley Hill, DY5 1XE — 756 yards to the southwest. Level street, Brierley Hill, DY5 1UA — 1130 yards to the southwest. Unit U (Upper) 76A Merryhill Centre, Dudley, DY5 1QX — 1182 yards to the south. Merry Hill Centre 51, Brierley Hill, DY51 — 1586 yards to the south. The Merry Hill Centre Unit L102, Brierley Hill, DY5 1S — 1347 yards to the south. 7 Albion Street, Brierley Hill, DY5 3EE — 1517 yards to the southwest. Brierley Hill — 1534 yards to the south. Falmouth — 1005 yards to the south. 1005 yards to the south. Andover — 1005 yards to the south. Brierley Hill, DY5 1TJ — 259 yards to the southeast. Kingston upon Hull — 1005 yards to the south. east campbell street, Glasgow — 1005 yards to the south. Mansfield — 1005 yards to the south. Brierley Hill, West Midlands, Brierley Hill, DY5 1QX — 1101 yards to the south. Russells Hall Hospital, Dudley — 1573 yards to the northwest. The Merry Hill Centre, Brierley Hill, Brierley Hill, DY5 1SY — 1616 yards to the south. The Food Court, Merry Hill, Brierley Hill, DY5 1SJ — 1138 yards to the south. 13 Mill Street, Brierley Hill, DY52RG — 1524 yards to the southwest. Brierley Hill — 1347 yards to the southwest. Woodside — 1233 yards to the northwest. London — 1005 yards to the south. Pedmore Road, Brierley Hill, DY5 1 — 1202 yards to the south. High St, Dudley, DY1 2HQ — 1514 yards to the northwest. Bank Street, Brierley Hill, DY5 3DH — 1309 yards to the southwest. Brierley Hill, DY5 — 1347 yards to the southwest. The Waterfront, Level St, Brierley Hill, DY5 1UR — 879 yards to the southwest. unit 2, venture way, Brierley Hill, DY5 1RG — 1572 yards to the southwest. Merry Hill Centre, Brierley Hill, Dudley, DY5 1SY — 1438 yards to the south. Level St, Brierley Hill, DY5 3 — 1123 yards to the southwest. Pensnett Road, Brierley Hill, Brierley Hill, DY5 3YP — 1222 yards to the west. Level St, Brierley Hill, DY5 1UR — 902 yards to the southwest. 1 Piers Road, Birmingham, B21 0UY — 1005 yards to the south.